Practical Strategies for Technical Communication is now available with LaunchPad– a customizable course space featuring an ebook and an exciting array of digital resources including a test bank, adaptive quizzing, multimedia Document Analysis Activities, and more. To order or purchase the print book packaged with LaunchPad, use ISBN 9781319018207. Mike Markel is director of technical communication at Boise State University, where he teaches both undergraduate and graduate courses. 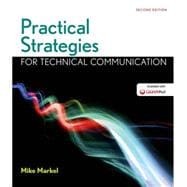 The former editor of IEEE Transactions on Professional Communication, he is the author of numerous articles and six books about technical communication, including Ethics and Technical Communication: A Critique and Synthesis. His latest book is Big Sick Heart, a mystery.